Rite Aid drugstore has weekly ads with BOGO deals, coupon content, special weekly offers, online-only deals, bonus cash, rewards, prescription offers, and more savings with different types of discounts. Browse the latest Rite Aid Ad on this page which is regularly renewed. Not only pharmacy is available in the ads, but you may also encounter some good price drops of snacks, grocery items, candies, etc. 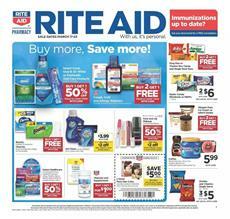 Use Rite Aid card to get most of the discounts of the weekly ads. Regular discounts are usually available for a limited time like one week. It’s one of the biggest pharmacy stores in the United States. It’s the largest in East Coast. Since 1962, the drugstore operated many stores and today they have 2525 stores across the country. The competition against CVS and Walgreens make the shopping even more profitable. Shop for your health-care needs with using Rite Aid Ads. L'Oreal Paris hair color will cost $5 cheaper with the coupon deal. You get 1 free Cough, Cold and Allergy reliever for free after purchasing 2 of them. BOGO 50% off Crest, Oral-B 3D, ProHealth is a deal on the first page. 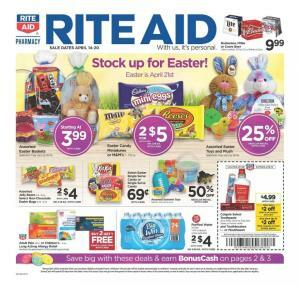 Shop Maxwell House coffee, Haagen-Dazs, King size chocolate, Easter Candy, and more from the latest Rite Aid food part. Get a 20% off discount with promo code: SPRING via the online purchase of Cheerios, G-free products on pg 2. Some household products like Arm & Hammer, daylogic sun care, and more are on sale, too. Buy Nature Made vitamins with another BOGO deal at Rite Aid Ad. Download the Rite Aid app for more savings. Health-care is the primary part of the Rite Aid Ads. You have Zyrtec, DayQuil, Advil, Sundown, Centrum products in the drugstore. You can also find vitamins and supplements. Earn $10 reward when you spend $30 on participating products.